Wow! Just wow! This movie was recommended to me and I’m glad I didn’t forget about it. 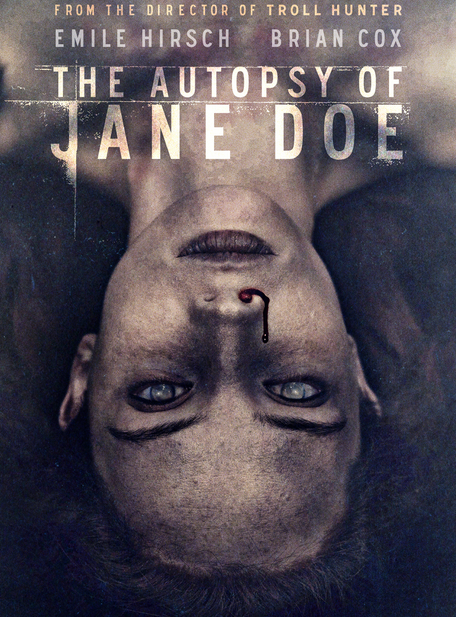 The Autopsy of Jane Doe is everything you would want in a modern day horror movie that doesn’t have a number next to the title or a credit such as “based on original characters created by” signifying a remake. This had me engrossed from the first scene. In part, this movie reminds me of The Twilight Zone or The X-Files in that you’re not really sure what’s going on. The entire cast is small with the main cast only being three and with a majority of the story taking place in a funeral home doubling as a medical examination facility. That’s really all you need! Father and son coroners Tommy and Austin Tilden (Brian Cox and Emile Hirsch) experience some unexplained supernatural activity as they begin to examine a mysterious body found at a local crime scene brought to them late in day by the sheriff played by Michael McElhatton. One of the investigators mentions something in passing that the crime scene makes little sense as it seems no one was breaking in and robbing (thus killing) the homeowners, but instead it seemed like someone was trying to break out of the house. That passing clue alone is brilliantly hit upon by director Andre’ Orvedal who has managed to successful keep this movie on a great pace. He allows for just enough character development to unfold to where the viewer does care about Austin (Hirsch) and Tommy (Cox) as well as for Jane Doe (Kelly) because as the Tildens’ world starts to unravel you really want them to figure out what is happening. Tommy and Austin have what appears to be a good relationship but Austin is torn and actually doesn’t want to work in the family business much longer. He doesn’t want to be the next generation of coroner. Part of the conflict does seem to trouble Austin, but as the story unfolds, he puts his feelings on hold. Deep down inside even Tommy may know this work isn’t his son’s passion as he catches him a couple of times being careless when they begin to work on Jane Doe. Ovredal has crafted a fine horror movie worthy of a large audience as it has many surprising scares throughout. I can’t recommend The Autopsy of Jane Doe enough. It’s one of the more creepy and character driven horror films I’ve seen in a quite a while. See the trailer HERE.